Jacque - your photography gets more and more interesting. Bedroom collage Jacque that something you can discuss on here ? x Or am I getting the wrong idea of a blue moon? Thank you for putting my mind at rest Jacque - someone should ! Lovely photos sure your bedroom will be like sleeping in a bed of roses bet Phil cant wait .You wont be asking him to make trellis in there for them will you? I've just managed to stop laughing long enough to say:- Jacque, this is an amazing picture, you are so clever! Bonkers, you're a real tonic! Jacque, garden photography is so popular now that every show I've been to this year has had workshops on the subject. You wouldn't need to go to them, though. U think Not David! i do have a good Camera&the Know how 2 Print ,Edit My Photos with Nice Soft ware from on Line 2 :),Is this what they Teach@these shows David? Ohhhh, Jacque, this makes me so homesick! 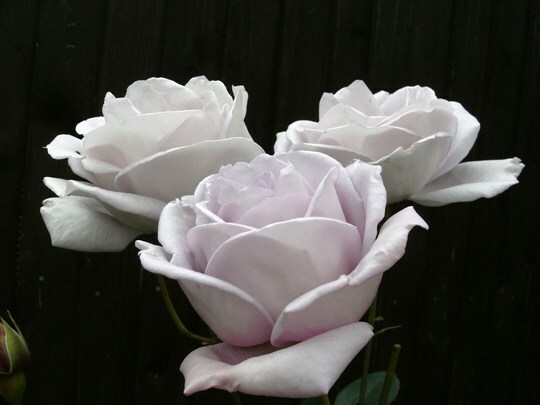 I used to have the Blue Moon rose ( it's a climbing one ) in my old garden. The smell was wonderful, a bit spicy like. Such an unusual colour too.Your pic is fabulous. Don't know for sure, Jacque, I meant to go but missed them all. Beautiful picture and a beautiful rose, does it have any scent?